happy monday, i hope a lovely weekend was had by all! the mr and i had quite a busy weekend and i must admit i'm pretty happy when my peaceful monday rolls around. i realize that i am one of the few folks in the world who enjoys this day, so i won't linger on that thought too long. today i wanted to share one of my new go to recipes. 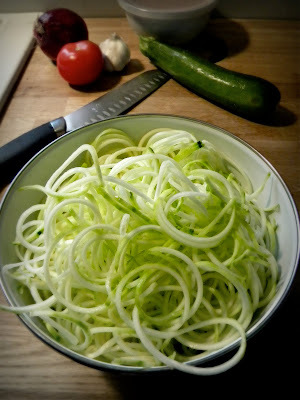 i mentioned in my last post that one of my recent obsessions is zucchini pasta. not only am i in love with it because it's so stinking delicious, but it's also so super easy to make and clean up after. this has become my raw food bible. 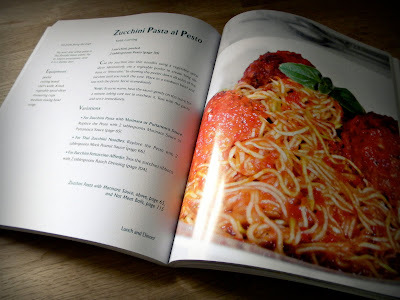 the recipes are so easy, and so far all fabulous! 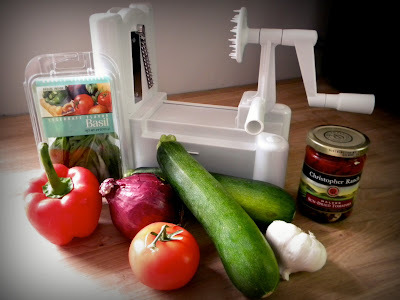 bell pepper, tomato, onion, basil, oil, sun dried tomatoes, garlic, zucchini, salt, pepper, and a spiral slicer. i purchased this slicer to really do the job right. i absolutely love it and would recommend it to anyone! 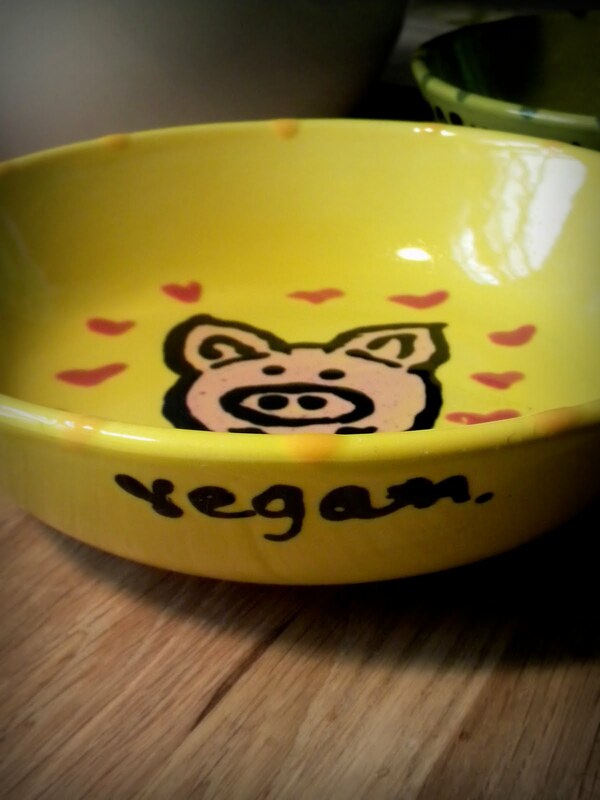 you certainly don't need one to make this dish though. 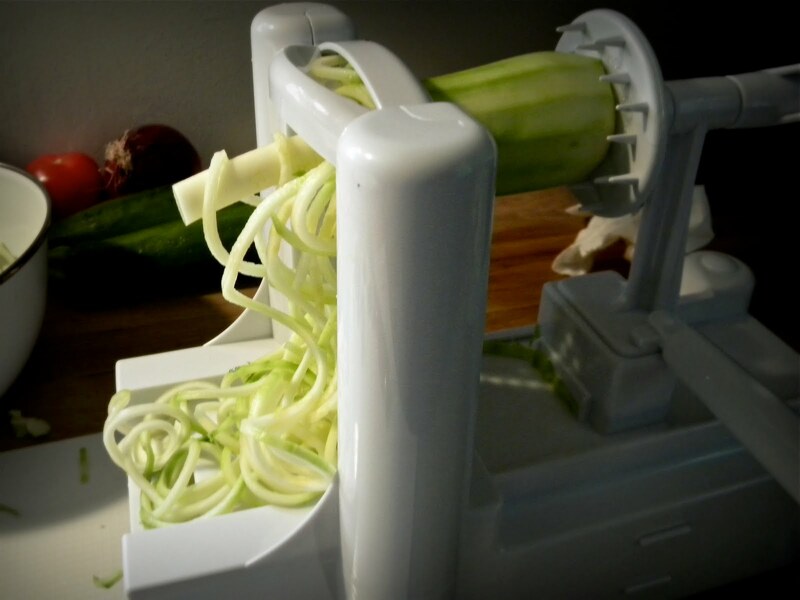 you can use a veggie peeler instead and make wider noodles. just as yummy! chop it all up and throw it in a food processor or blender. easy peasy! this slicer makes it ridiculously easy to make long spaghetti type noodles. some ended up being about 3 feet long and i realized i should probably go ahead and slice them up a bit before serving. it takes all of about 30 seconds to turn one zucchini into a bowl of noodles! 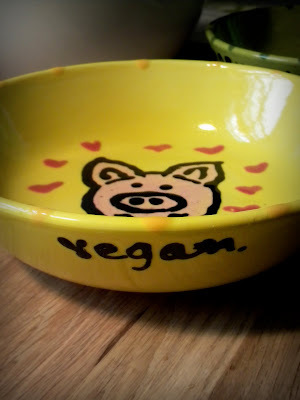 evan and i always eat pasta out of these super cute bowls our friend lesli made us for a wedding gift. 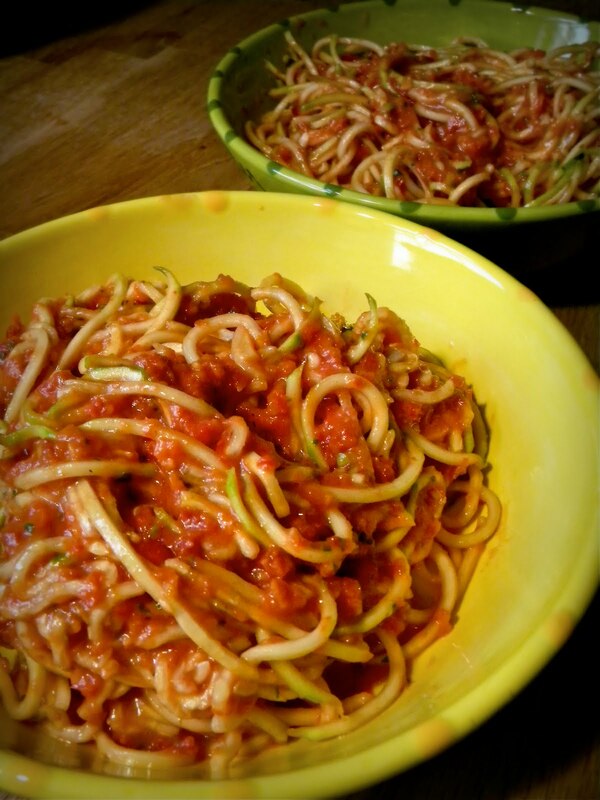 and just like that you've got an amazing raw, vegan pasta meal you can feel fantastic about devouring! 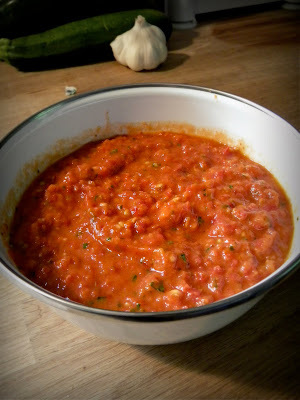 we went ahead and ate ours at room temperature and it was amazing, but you can certainly warm it up a bit if you like. 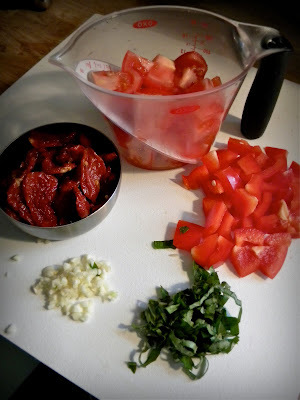 the goal of eating raw is to retain as much of the nutrients as possible without cooking them away, so you just don't want to heat it above 116 degrees F.
i've made the pasta for lunch a few more times since this, and just had it with fresh basil, olive oil, and chopped sun dried tomatoes. it's been amazing each and every time i've had it. you simply can't go wrong! 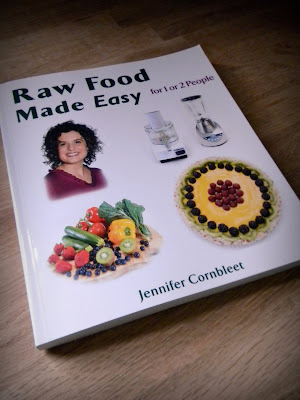 if you're thinking about working some raw meals into your diet this book is a great place to start. almost all of the recipes use about 5 or 6 ingredients, and they're often things that you would already have in the house. i'm the kind of person that gets easily overwhelmed by cookbooks, but i've found this one to be a great intro into the world of raw food. amazingly easy, and equally as tasty! you can also watch the author, jennifer cornbleet, make this recipe here, and some of her many other creations here. 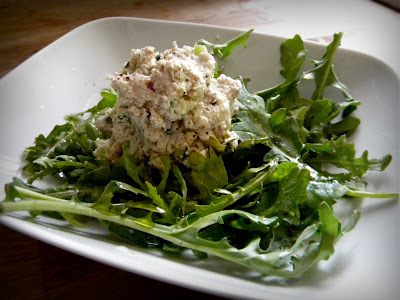 also check out her "not tuna pate". it's the perfect thing to keep in the fridge for a quick healthy raw lunch. i especially love it on a simple bed of arugula, with a drizzle of olive oil, a splash of lemon, and a bit of ground black pepper. yumm-o!